A few days ago, I returned from a beautiful two weeks vacation.I kept in touch with a local female from where we went and I contacted her to give me some instructions for Pork Tacos recipe from her country and gave me this. I was in some exotic places where the sun shined till the early morning till the later night. I had a lot of local trips and a lot of fun visiting, eating and partying there. Returned home, on a morning I was thinking what should I prepare to surprise my soulmate and using something similar to what we’ve eaten in our vacation. Considering our summer is a little breezy, I thought something spicy will warm our souls.She recommended a combination of spice pepper and pineapple. I was “Oh god! What are you giving me?” She encouraged me to do it, “it will warm your summer as you wished, she said. Ok! Let’s do it then. 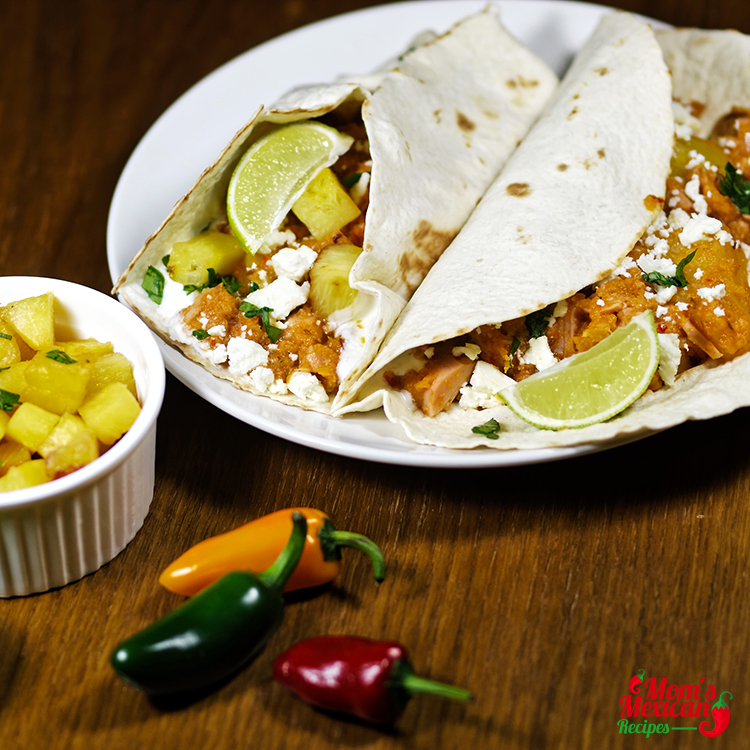 I started preparing this Pork Tacos recipe and I was very skeptic how pineapple and chili could work together? In the end, I was extremely surprised how it tasted. The yummy sweet taste of pineapple a little spicy combined with some asunder pork roast and crema Mexicana, made my mouth drool. My soulmate thought he was in heaven. Definitely will try again this masterpiece. 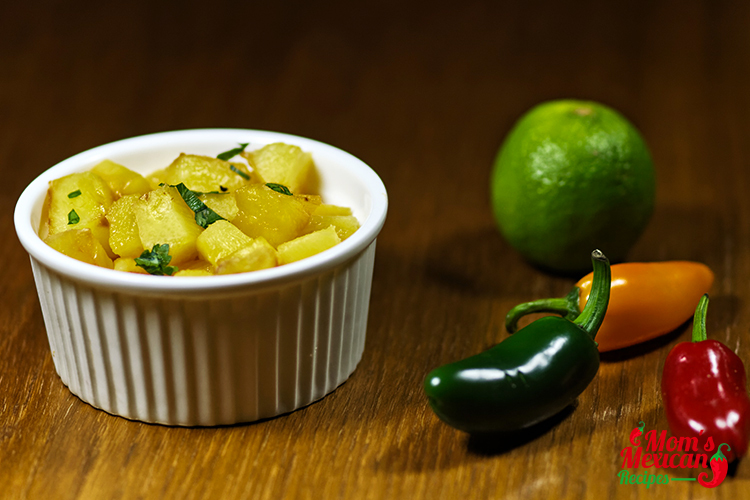 To make the sauce, place ¾ of the yellow onion, ½ of the pineapple, the pineapple juice, apple cider vinegar, chile powder, garlic, salt, oregano, cumin, chipotle chiles, adobo sauce, and ¼ cup water in a blender and puree until smooth. Place pork roast into the crockpot and pour in the sauce to cover the pork. Add in the remaining ¼ of the yellow onion and a quarter of the pineapple. Reserve the last ¼ of the pineapple for topping the tacos. Cook pork in the crockpot for 4 hours on high or 8 hours on low, checking occasionally. When pork has finished cooking, remove from the crockpot and chop/shred. Return to crockpot and mix pork in with the sauce, allow pork to simmer in the sauce. While pork and sauce simmer, heat a skillet over medium-high heat. Place remaining pineapple chunks in skillet and char for 2-3 minutes. 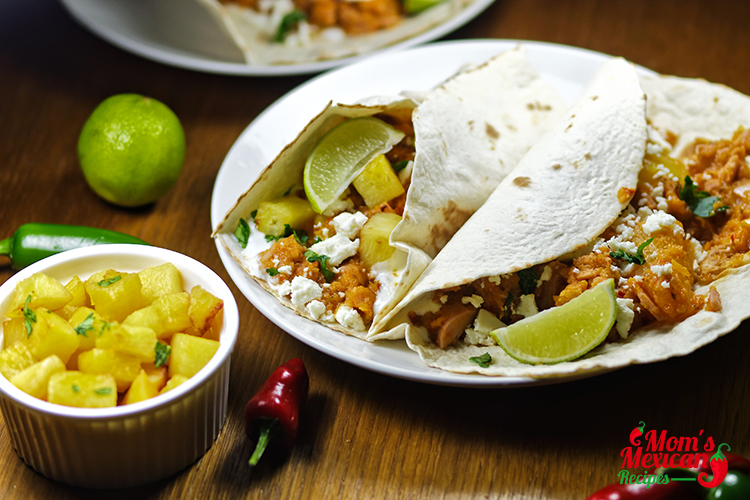 To serve tacos, warm tortillas in a skillet for 1-2 minutes. 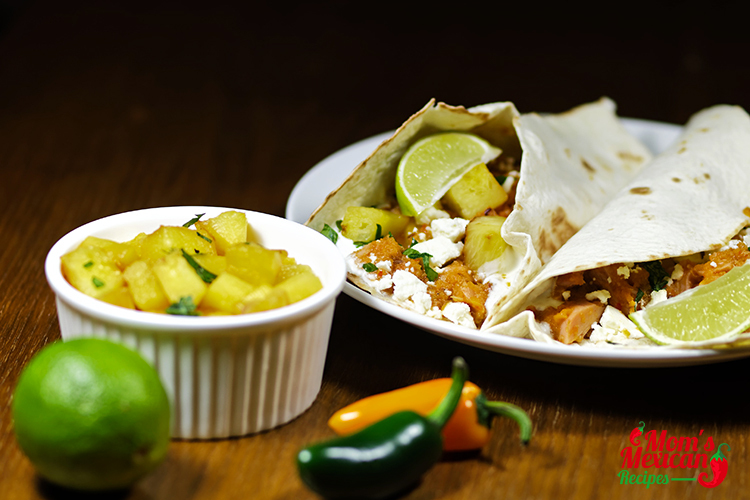 Top tortillas with pork, charred pineapples, cilantro, chopped white onion, cotija, crema, and a lime wedge.